Is the GRID foam roller really worth so much money? What does it offer than a 3x cheaper foam roller doesn’t? Let’s find out. The TriggerPoint GRID Foam Roller is far and away one of the most popular foam rollers on the market today, and for good reason: this thing is great. The TriggerPoint brand is widely recognized as making excellent products, and is recommended by physical therapists, massage therapists, chiropractors, and sports physicians across the country. 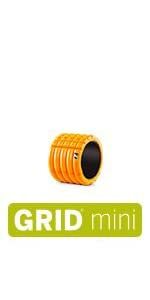 But what makes the GRID Foam Roller different than your garden variety roller? Let’s break it down. What Makes The GRID Foam Roller Different? First off, let’s examine what gives the GRID it’s name. This roller, rather than having a uniform smooth surface, has grooves throughout the surface of the roller, creating a grid. What this effectively does is creates zones of different firmness and multiple densities across the roller’s surface. When rolling, you can utilize these different zones to alter the pressure of your myofasical massage. 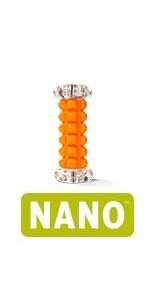 Unlike conventional rollers, which are just solid tubes of foam, GRID Foam Rollers are hollow. The hollow core is rigid, allowing the roller to support up to 500 pounds on most models. The core is then surrounded by the patented grid-patterned EVA foam. The GRID Foam Roller has a couple things going for it. First and foremost is durability. If you foam roll often, or are purchasing rollers for use in a gym or clinic, you’ll notice that most standard foam rollers will start to wear out after repeated use. The GRID, thanks to the rigid core, won’t. So while the higher price tag might look intimidating at first, you’ll likely make your money back over time by not buying a new roller every six months. 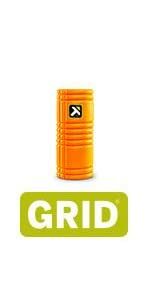 The GRID is what I would consider a moderate foam roller – not too firm, but not too soft. (They also have an extra firm version, which I’ll mention in a bit.) That really makes it a great all-around roller; it might be too firm for certain individuals and certain injuries, while not being firm enough for others…but the vast majority of people will find that this roller suits them perfectly. That makes the GRID roller a great choice for your first roller purchase, if you’re not yet sure how much firmness you’ll need. I also like that TriggerPoint is producing the GRID Foam Roller in varying sizes: the original GRID is 13 inches long; the GRID 2.0 is 26 inches long; the GRID mini comes in at just 4 inches; and their ultra-firm version, the GRID X is 13. TriggerPoint has also added two manual rollers: the GRID STK, a 21-inch manual stick roller; and the NANO, 6.5 inch foot roller. Which size you’ll want is a matter of personal preference and usage habits. A original GRID, at 13 inches, is highly portable. You can throw it into your gym bag before you leave for a workout, or even take it with you to work. For dedicated home use, I prefer the longer GRID 2.0. One great thing about the entire GRID product line is that, when purchased online, they all come with free online instructional videos from TriggerPoint. Our website already has contains a number of online instructional videos for foam rolling various muscle groups, but I suppose more never hurts. 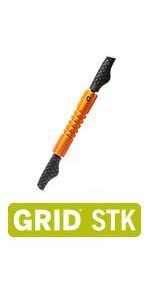 The GRID is a great roller, and is one of the most popular models available. With that popularity has come imitations. There are plenty of knockoffs on the market; if you’re buying a GRID, make sure to stick to a reputable vendor with good reviews and a good return policy, just in case. 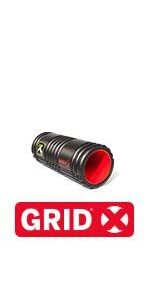 When your GRID arrives, check to make sure that it has the TriggerPoint logo. The only other con I would name is the price. These rollers can be a bit on the steep side. Like I mentioned earlier, if your roller sees a lot of use – and abuse – you will likely save money in the long run with the GRID. However, if you’ve never tried foam rolling before and don’t know what size or firmness you prefer with your rollers, they’re a little on the steep side for a product that you might not like. If this sounds like you, and you have a gym membership, check to see if your gym has any TriggerPoint rollers. That way you can try before you buy. Which GRID Foam Roller is Which? The GRID comes in a variety of models – which vary in size – and also comes in a number of different colors. The way to differentiate between different firmnesses with GRID rollers is to look at the color of the inner core. GRID rollers with black cores are the standard, moderate firmness. The GRID X is extra-firm, and features a red core. 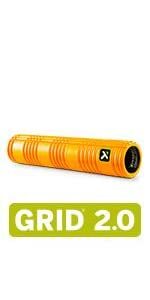 Overall, the GRID foam roller is an excellent all-around roller. I prefer the original version to the extra-firm GRID X model. If you have a really tough-to-roll area, I’d check out the Rumble Roller Extra Firm. But if you need a highly portable, high quality, nearly indestructible roller that will help alleviate sore muscles and increase recovery…well then you can’t go wrong with the GRID.